NFC (Near Field Communication) is a set of standards which allows users to communicate between a pair of devices which have the feature enabled; by just touching or bringing both close to each other. While the technology and handsets around NFC are just starting to become popular, Samsung has already stepped in with Samsung TecTiles. Samsung TecTiles is a two-part process. 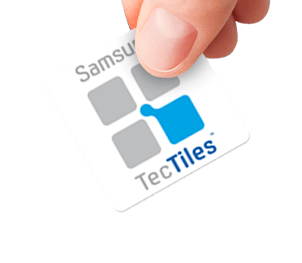 Firstly, to use Samsung TecTiles you need to purchase TecTile tags, which cost $14.99 for a set of five NFC tags/chips. These tags store commands and limited data (they are not attached to devices, don’t mistakenly stick it to your device). TecTile tags can be bought directly from Samsung’s website  or other authorized sellers. Secondly, after you have TecTile tags, you need to download Samsung TecTiles app  from Google Play Store (it is free); this app is used to program the tags (store commands in them). 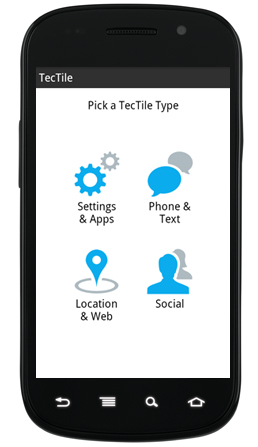 Once you have both the tags and app, you can read from and write to the TecTile tags. Essentially what happens is you program commands/store data in each tag by using the TecTiles app. Then whenever you want to execute the commands stored on the tag on your device, or transfer data from the tag to your device, you “tap” the tag with your device and the transfer happens automagically. Of course this means you must have an NFC enabled device to use TecTiles. Ensure that NFC is turned ON. Launch the TecTile application. Select the ‘TecTile Type’. Then, select the action you want to do and then tap ‘Next’. When the application asks you to, hold your phone over the TecTile (with your phone’s back facing the TecTile) until you have successfully written the tag. This reportedly takes just a matter of seconds. To use the tag (execute the command on the device), just unlock your device and hold it over the TecTile tag. TecTiles wouldn’t function when placed near metal bodies (though there is no risk when placed near metal bodies). For a complete list of NFC supported devices, visit Wikipedia . You can make lots of different types of tags like change phone settings, launch an app, set alarm, make a call, send an SMS, Facebook & Foursquare check-in, update Facebook status, make a tweet, connect to LinkedIn, etc. Most of the tags will work on all phones which have NFC support (TecTile application installation not necessary). You can set a tag to perform a specific function permanently. But be aware that it cannot be edited or re-written after that. Doesn’t that look quite interesting? Aren’t you going to make an order? Or, have you found something wrong or indigestible about the idea? Share your thoughts with us in the comments  below.